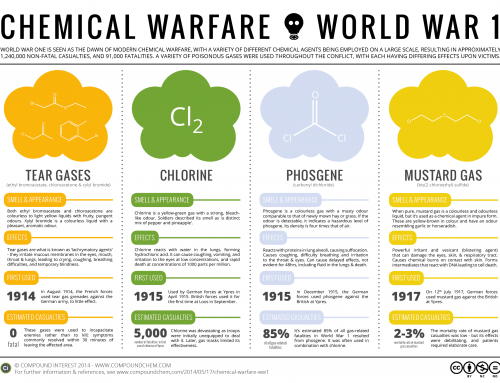 Today’s graphic looks again at the darker side of chemistry, after the previous post on the various chemical agents used in World War 1. 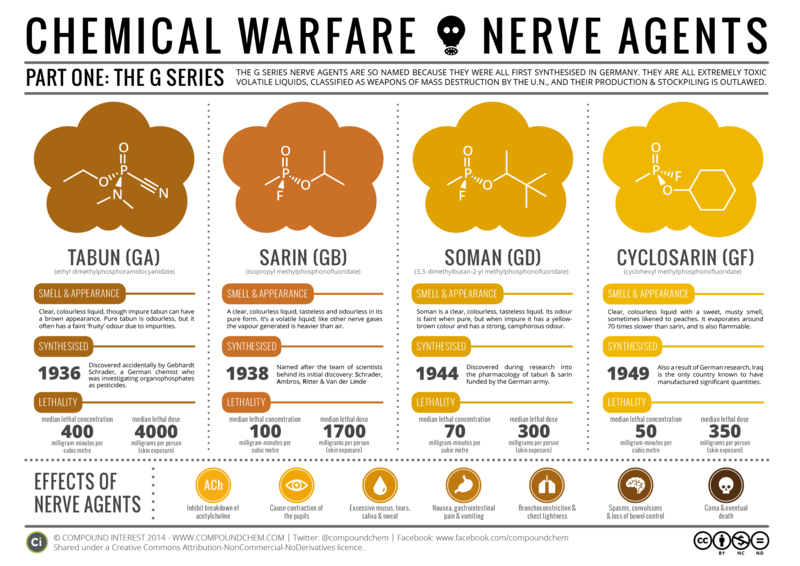 The present day spectre of chemical warfare is largely concerned with nerve agents, which come in two main groups; today’s post examines the G series of nerve gases, including sarin, which has made the news in the past year following its use on civilians in Syria. The G series of nerve gases is so named due to their origin, with all of them originally discovered in Germany in the 1930s and 40s. Their discovery was actually a complete accident; Gebhardt Schraeder, a German researcher, was investigating the potential use of organophosphates as pesticides in 1936 when he synthesised the first of the G series nerve gases, tabun. He also played a part in the discovery of sarin in 1938. The other member of the G series, soman and cyclosarin, were discovered during the course of research funded by the German army into the pharmacological action of tabun and sarin. Despite being referred to generally as gases, all of the G series nerve agents are clear, colourless liquids at room temperature, and are also tasteless and odourless when completely pure. 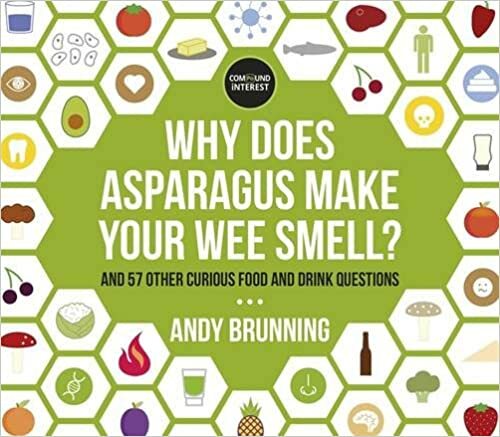 Impurities can lead to yellow-brown colouration, however, as well as varying faint odours. Although liquids, some of them are very volatile, meaning they can easily escape from the surface of the liquid and become a vapour. Because of this, we need to use two different methods to assess their lethality – one to determine their potency when airborne, and one for their potency in cases of skin contact. For skin contact, the usual median lethal dose, or LD50, nomenclature is used. 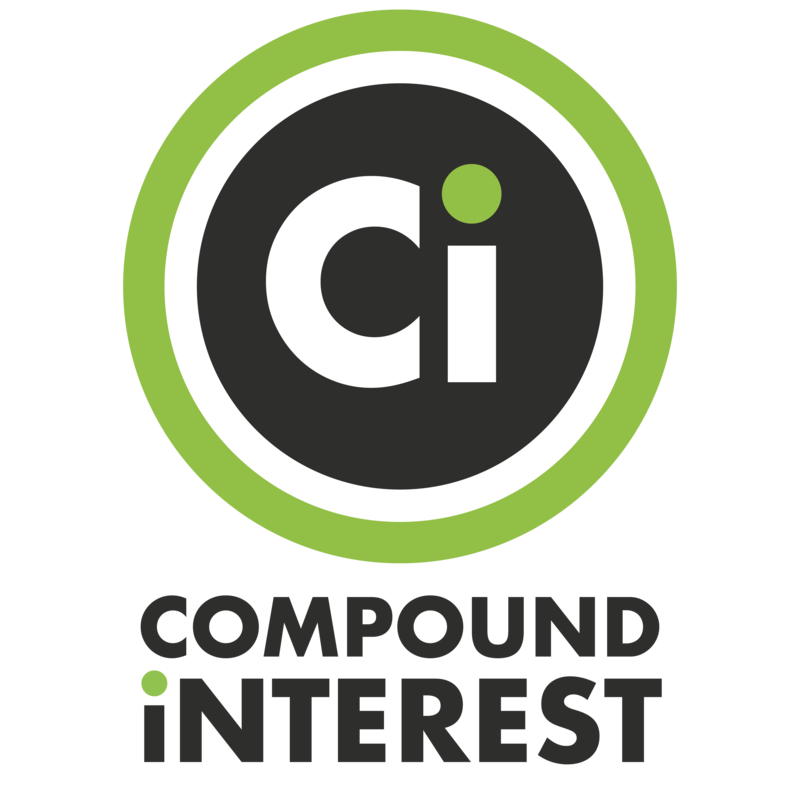 This is the amount of the compound needed all at once, per kilogram of body weight, to kill half of a test population. Obviously, these are rough estimates from animal tests, and actual figures for humans are likely to be variable. Using this as a measure, however, sarin actually comes out as the least potent of the four compounds featured here. The other method we can use to assess lethality, and one that’s more applicable to gases, is the median lethal concentration and time. This is measured in milligram-minutes per cubic metre – that is, it takes into account both the concentration of the gas and the length of exposure. At higher concentrations, this implies that exposure to 100 milligrams of a nerve gas per cubic metre for a minute would have the same lethality as exposure to 50 milligrams of the gas per cubic metre for two minutes. Generally, this relationship between concentration and time holds true, though at lower concentrations it does not. Using this measure, cyclosarin still comes out on top in terms of lethality, but it’s worth considering that it’s around 70 times less volatile than sarin – hence sarin’s much more frequent use when these chemical agents are deployed. The G series nerve gases are classed as weapons of mass destruction by the United Nations. In order to understand why that is, we have to look no further than some of the horrific effects that they can have on the human body. All of the gases in the series, regardless of their specific identity, act in much the same way. They all inhibit the breakdown of the neurotransmitter, acetylcholine. This chemical is responsible for telling muscles to contract – when its breakdown is prevented, it prevents muscles from relaxing, which can in turn lead to a range of other effects. Symptoms of exposure to nerve gases are initially mundane. Those affected may notice a runny nose, excess salivation and sweating, and contracted pupils. These symptoms quickly escalate, however, to constriction of the chest, difficulties in breathing, nausea and vomiting, and loss of bowel control. This gradual loss of body function continues, culminating in spasm and convulsions, and perhaps coma, before eventual death due to respiratory failure. The effects of exposure last for a significant amount of time, and even those lucky enough to survive do not necessarily do so unscathed; they almost always suffer neurological damage. Antidotes to nerve agents do exist, but they, too, are often poisonous. 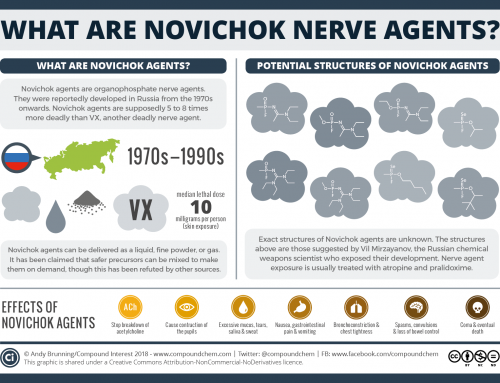 Compounds that block acetylcholine receptors can be effective at mitigating nerve agent poisoning, and for this reason the chemical atropine is commonly used as a component of antidotes. Member of another family of compounds called oximes are sometimes used in conjunction with atropine; they work in a different manner, restoring the enzyme that helps break down acetylcholine to working order. 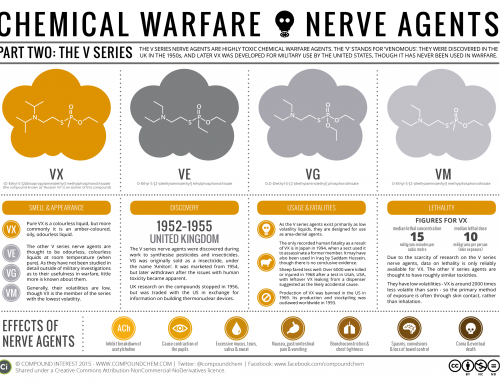 Despite the international agreements prohibiting the uses of dangerous gases in international warfare, the nerve agents have still seen use in combat situations, even in recent years. In the war between Iraq & Iran, which lasted from 1980 to 1988, Iraq used chemical weapons, including mustard gas, but also tabun and cyclosarin. Outside of conflicts, terrorists also released sarin into the Tokyo subway in 1995, killing 13 people and severely injuring 50. Perhaps the most serious breach of international regulations regarding nerve gases came last year in Syria, however. In five separate incidents between March and August 2013, the use of sarin in civil war conflicts was suspected, and the United Nations have confirmed that the nerve agent was definitely used in three of these. An attack in Ghouta in mid-August was the most devastating; whilst exact casualty figures aren’t known, it’s estimated that as many as 1,700 civilians may have been killed as a result of exposure to sarin. Though the damage may be done, Syria has since destroyed its stockpiles of sarin. The international regulations against the production and stockpiling of the G series nerve agents remain, and the chemical precursors to its synthesis are controlled, but due to their effectiveness and potency, it seems likely that their shadow will always loom over modern warfare.